NVS/ Navodaya Vidyalayas Principals, PGTs, TGTs, Asst Commissioner Recruitment 2016 Exam Dates, Hall Tickets/Admit cards download. NVS Principals, PGTs, TGTs, ACs Recruitment Admit cards 2016. NVS Assistant Commissioner and Principal Admit Cards 2016, NVS PGT, TGT, TGT Miscellaneous, TGT (IIIrd Language)2016 . 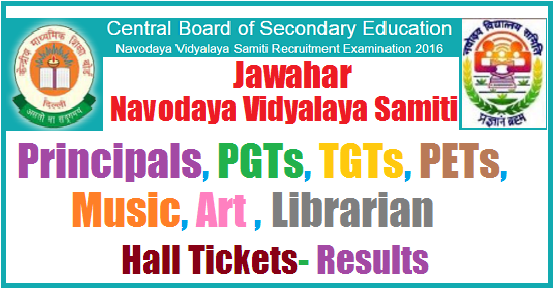 NVS Principals, PGTs, TGTs, ACs Recruitment admit cards 2016, exam date, NVS Recruitment 2016, Navodaya Vidyalaya samiti 2072 Teaching, Non Teaching Posts 2016 recruitment. NVS Jobs 2016 Notification. Recruitment of Assistant Commissioner, Principal, PGTs,TGTs, Miscellaneous Teachers & TGTs (III Language) 2016 in Navodaya Vidyalaya Samiti. Online applications, vacancies, eligibility criteria, how to apply, method of recruitment details, hall tickets/admit cards, key, results are given here. Navodaya Vidyalaya Samiti, henceforth mentioned as NVS, an autonomous organization under the Ministry of Human Resource Development, Govt. of India invited online applications from 10-09-2016 (08:00 hrs) to 16-10-2016 (from Indian citizens for recruitment to the posts of Assistant Commissioner, Principal, PGTs, TGTs, Miscellaneous Teachers and TGTs (III Language) for the year 2016. NVS Assistant Commissioner and Principal Examination scheduled to conduct to be on 04-12-2016 and NVS PGT, TGT, TGT Miscellaneous, TGT (IIIrd Language) Examination scheduled to conduct to be on 11-12-2016 . Candidates can download the admit cards of Navodaya Vidyalayas Principals, PGTs,TGTs, PETs, Music, Librarian Posts 2016 from here. Part-I Reasoning Ability 20 20 The test will be of 3 hours duration without any time limit for each test individually. General Paper COMMON PAPER FOR ALL POSTS OF PGTs, TGTs, Miscellaneous and TGTs (III Language): Objective type multiple choice questions on General English & Hindi (40:20+20), General Awareness (30), General Intelligence, Numerical Ability & Reasoning (30) , Teaching Aptitude (20) and concerned subject knowledge (80). The difficulty level of the question papers for PGTs will be of Post Graduation standard and for TGTs and others it will be of Graduation standard. 200 Marks/ 2 hrs 30 minutes.